5 tools to rule all your feedback processes. Start annotating today. Simply add your required tools in an array in the Usersnap configuration object. The tools parameter follows the order you’ve specified in the tools array. The highlight tool may be used to indicate important areas on the page. The created highlighted areas can be easily removed by clicking the [trash bin] icon in the upper right corner. Your users can black out private areas on your page with a black rectangle, when they think an image or block of text is superfluous. If you want to remove a blackened area you can easily remove by clicking the [bin] icon in the upper right corner. With the note tool you can put detailed information to the screenshot. Use it like you would use a sticky note on paper. You can move the sticky note with drag and drop! The pen tool allows you to make free annotations on your website. You can remove the line by using the [bin] icon when you are near the line. The arrow tool enables you to point out specific parts of the website. You can remove the arrow by using the [X] icon when you are near the arrow. 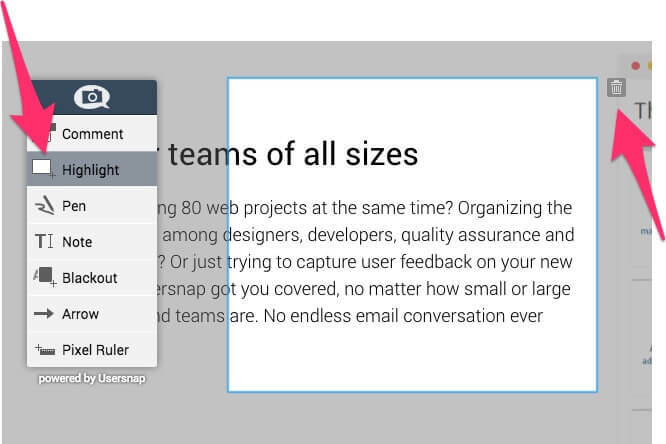 One of the less known annotation tools of the Usersnap feedback widget is the Pixel Ruler. You can simply measure the width or height of a certain section on your site with the pixel ruler. It’s pretty awesome! Start configuring your dream team of tools today! We invite you to try out our service for free. Sign up for our 15-days trial program!